180° Screen Full Visual System available. In Flight Simulation, the projection approach is without any doubt the best possible one. This is because it enables the pilot to feel the sensation of space similarly found in a real aircraft. 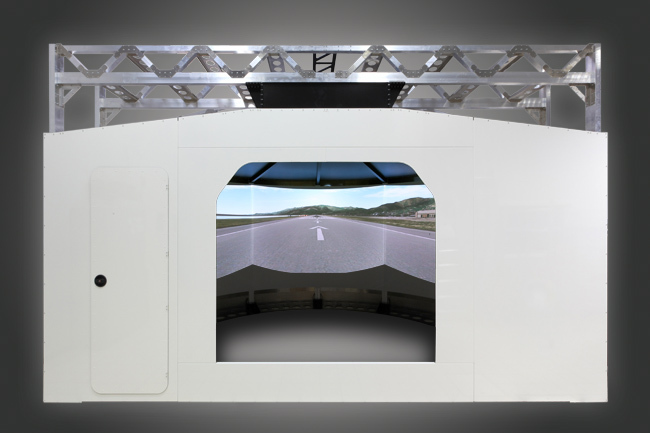 Projecting the OTW (Out-The-Window) image on a surface which is at a distant focus from cockpit's windows, also because of the parallax effect caused by the viewer/cockpit windows/screen visual interaction, allows the crew to experience a closer approximation to a real scene. The structure is built entirely from reinforced aluminium and ships with detailed assembly instructions. Like every FSC System, we assemble each product in our laboratories and test it extensively, then we proceed to shipment. On request, our technicians can also assemble the System on site for you. The complete visual System includes also 3x High Brightness Projection Design branded HD Projectors, specifically engineered for simulation tasks, and optimized for professional, continuous 24/7 use, obtaining a global screen resolution of 5760x1080 Pixels. Also included are HDMI signal distribution cables, interfaces and special cable extenders for connection with PCs up to 60meters/200feet. Trough the use of software warp, there's no need of special projectors, improving the system affordability without sacrificing the image quality. Optimal temperature control of Projectors is obtained through the additional integrated venting system, additionally, the System can be turned on/off remotely, through a software panel. Optionally you can request a FULL HD external monitoring system for an audience placed outside the cockpit, which can be mounted on top of the structure enabling wider viewing coverage.